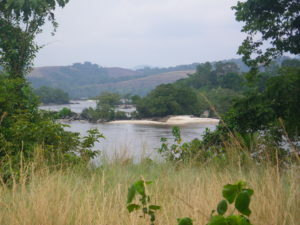 After trips in 2003 and 2010, we return to Gabon for a third adventure. Adventure, you say ? Yes, it is ! Let’s go ! Marc Sosef is an important Africa Begonia expert from The Netherlands. He explains in his thesis “Refuge Begonias” that the mountains of equatorial Africa (in Gabon : the Crystal Mountains, the Chaillu Range and the Doudou Mountains) were refuges for Begonia (of Loasibegonia and Scutobegonia sections) during the colder and dryer glacial periods ; during the Pleistocen Era, forests and plants didn’t stretch outside these mountains but remained within them. 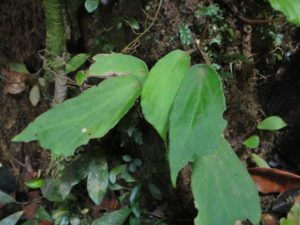 From which it follows that there are many endemic plants and vegetative propagation instead the sexual multiplication. The prof of this is the lack of self-fertilization and the few fruits we see. After long and difficult negotiations (several months ! 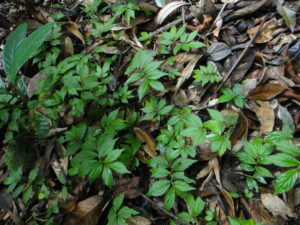 ), I got from Gabon authorities (ANPN, National Agency of the Nature Protection and its scientific unit) permits to go, search and collect plants in the parks. 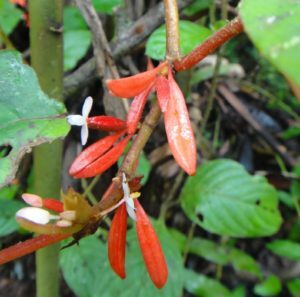 In the addition, I must also have , but didn’t get, an export authorization issued by the Herbarium which was closed when we came back to Libreville. This time, we have planned to pass through São-Tomé both ways, and so we transit via Lisbon. We take off from Nantes on May 29. The small island (about 5.6 sq. mi.) 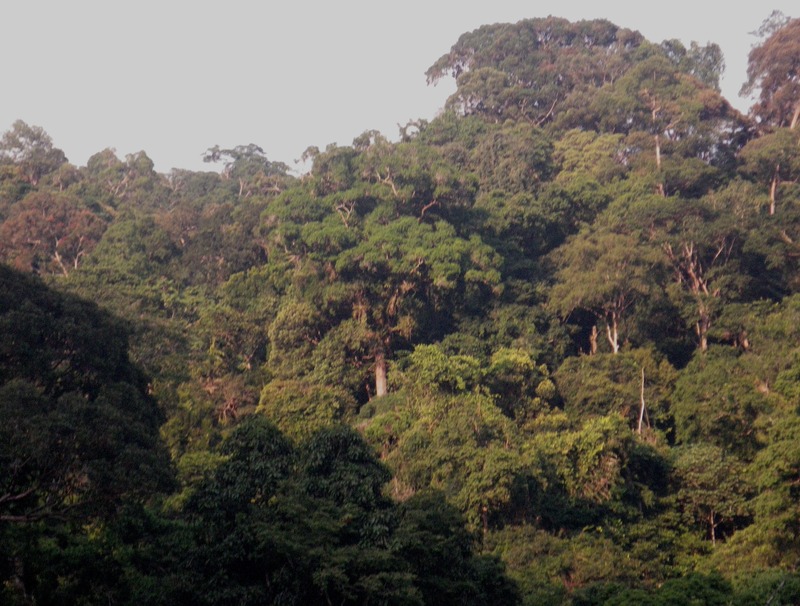 of São-Tomé – Principe, independent since 1975, is an extinct volcano which is 6,600 feet at its highest point. All the mountains are covered with rainforest and tops are often in clouds. 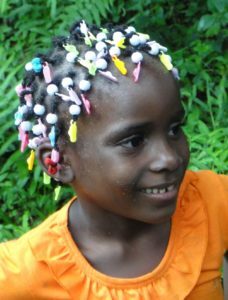 Why São-Tomé ? Begonias, of course ! No yellow-flowers begonia here, the island is too young relative to the continent where Gabon is, but there are many endemic plants because this island has been isolated for a long time : São-Tomé is in Atlantic, 220 mi out from of Gabon, at the equator. 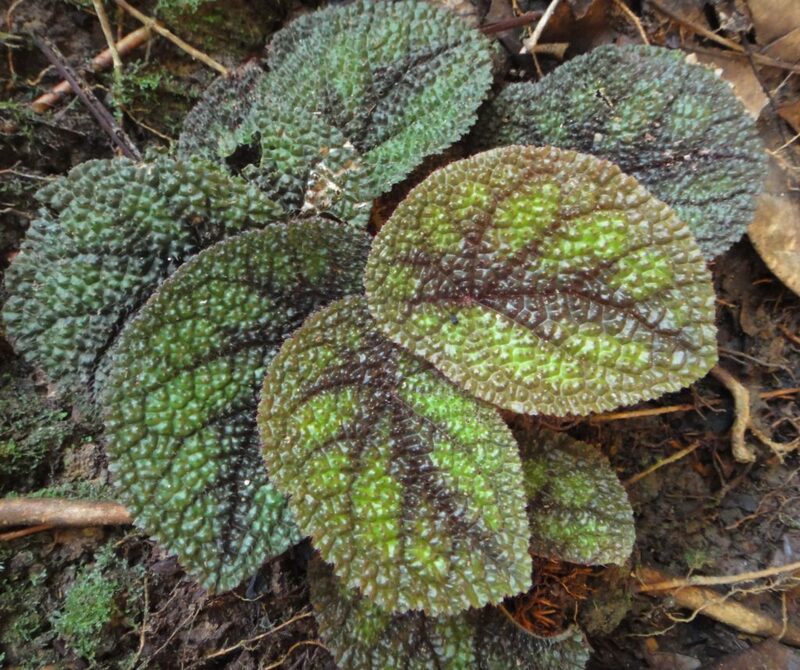 However, we can see interesting begonias such as endemic and emblematic Begonia baccata (photos 2/3/4/5) . We encountered them on our first trek from Bom Sucesso to Bombaim, not really a walk in the park (12 mi, in mountains, 90°F in the shade !) 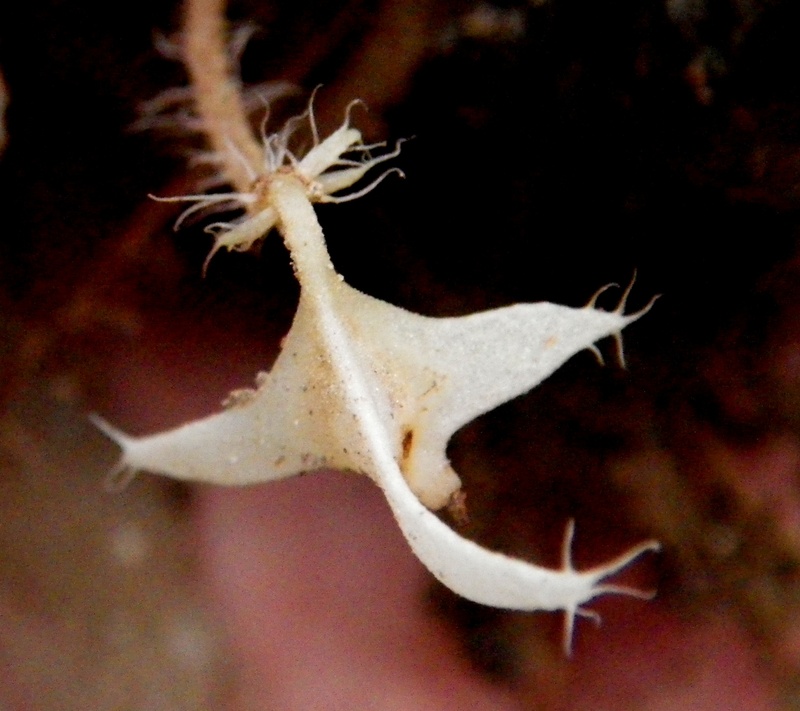 B. baccata grows everywhere, from the sea level to 5,,000 feet. 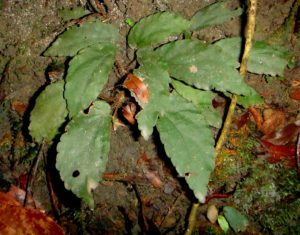 It is a spectacular begonia, often erect, and so it is 11/2 m high, sometimes hanging on slopes and lava cliffs or epiphytically on trunks. It is often in bloom now and we can see many berry-like fruits, in the process of formation. They will be ripe when we come back in June when they will be red. We see many seedlings on slopes and on the walls of the ruins of of old portuguse coca farms (roças) dating from before independence. 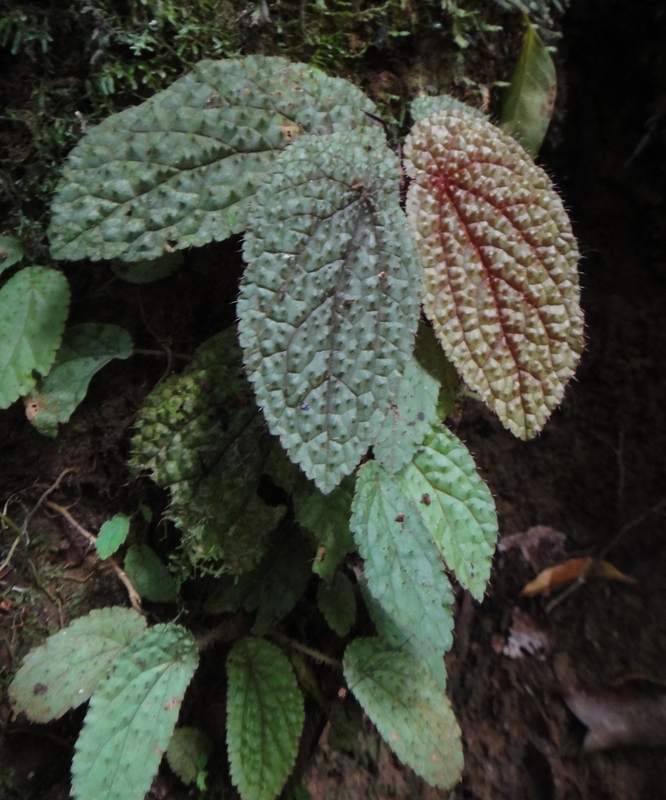 During this trek, we also find Begonia crateris (photo 6) near an old crater. This species looks like B. baccata but the plant has an indumentum of scattered small hairs and leaves are peltate and thick ; it seems to be less tall than B. baccata but perhaps we have seen only young ones ? 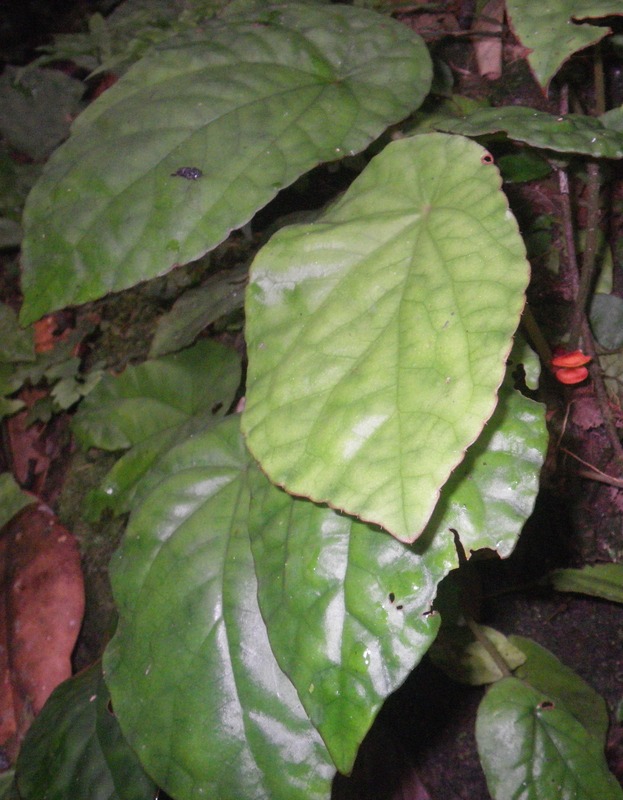 No flowers, no fruits ; it is less common than B. baccata and it is limited to altitudes between 3,000 and 5,000 feet. 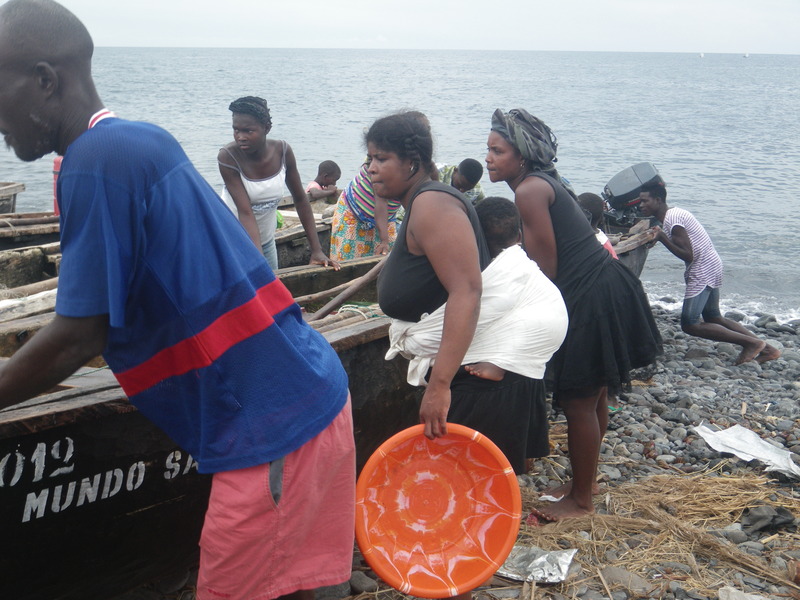 During the second stop to São-Tomé, after Gabon, we travelled along the sea on the west coast. We again saw B. baccata on damp lava cliffs with another small annual species, Begonia annobonensis (photo 7/8) which is found on the Annobon island (at 125 mi south-west of São-Tomé), hence its name. On this begonia we noted a tuft of hairs at the junction of the petiole with the leaf blade. 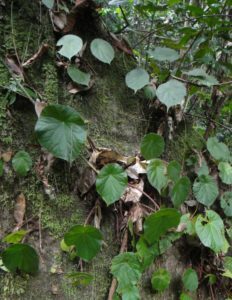 A forester comforts us with a tasting of palm-wine he had just made… Francisco stocks up, for his lunch, with… big beetle larvas found in a rotten stump ! We find in this area Begonia ampla (photo 9). 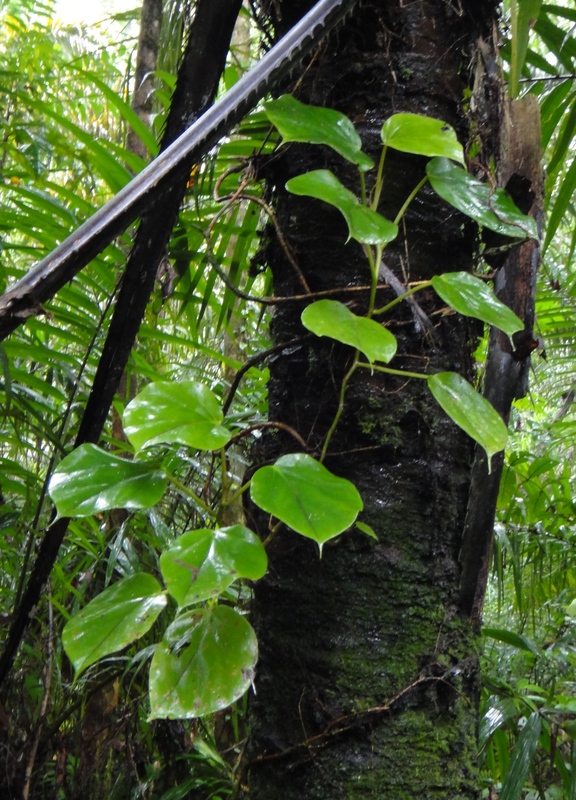 This species is not endemic here ; its grows all over equatorial Africa. 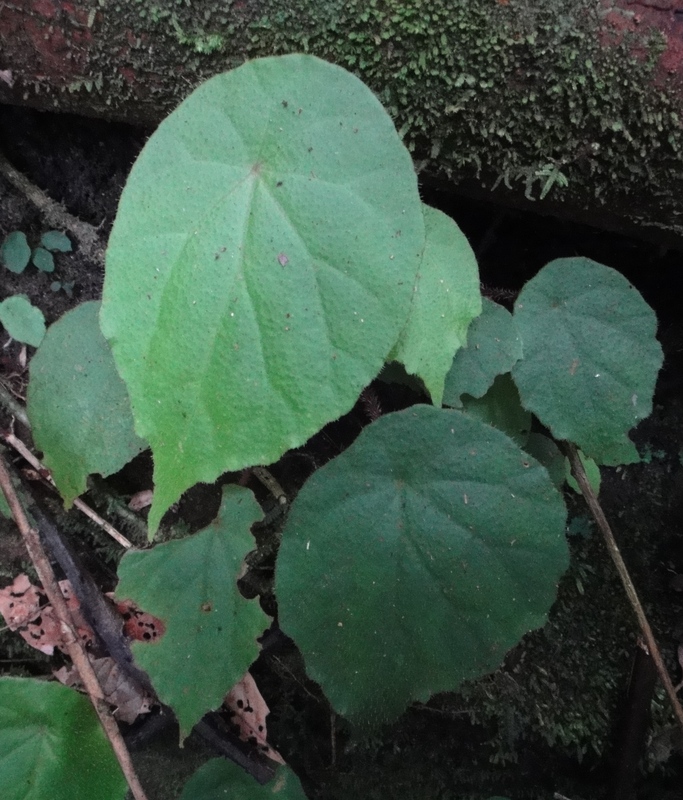 Only one is in bloom but we see many epophytic seedlings on trunks. After these two brief but intense stops, we leave São-Tomé and its very kind inhabitants. This island is not a paradise, but wehold excellent memories of smiling people (photo 10), especially those of the west coast fishing villages when the pirogues come back (photo 11). Libreville : a visit to ANPN where we meet Flora Koumba Pambo of the Scientific unit who set up my preliminary inquiry. Thanks to her I got authorizations for entering and searching in the national parks. We take the 4×4 and we start towards the Crystal Mountains in north-west Gabon. June is the beginning of the dry season and the sky is often grey in the morning. The road is disastrous from about sixty km from Libreville on, I guess from raint season problems ! Then I find then a nice species (photo 15) and I don’t know it : ln’t know it. 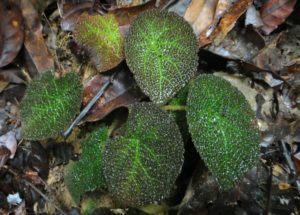 eaves peltate, entire margin, dark and asymetrical blade, eltate, marginf a form of I think of Begonia peperomioides, a rare endemic of the Crystal Mountains. 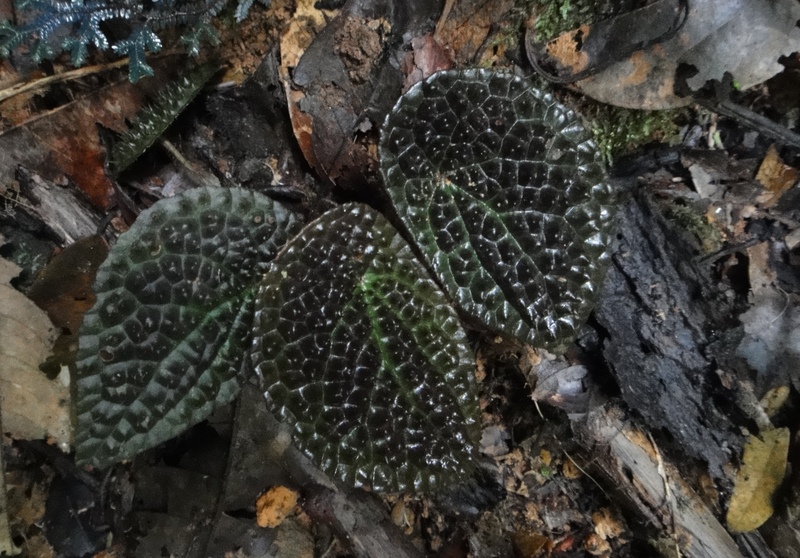 Unfortunately, B. peperomioides has no peltate leaves ! 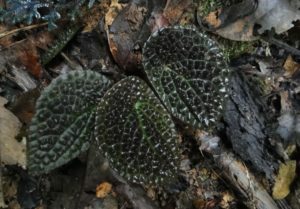 Marc Sosef thinks of a form of B. clypeifolia ! Disappointment ! 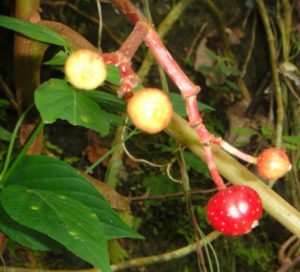 Begonias epiphytic are present near this stream too : B. elaeagnifolia and B. eminii in full light, in bloom and with red fruits (photo 16). 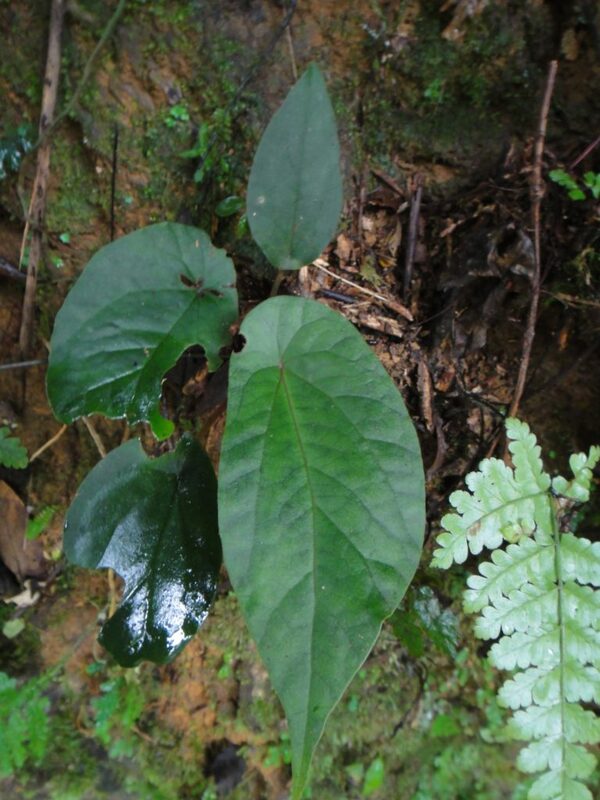 On rocks of this very rich place,, we see a nice small Impatiens and many Costus englerianus with white flowers. We leave the edge of the park and go towards Kinguélé, in the same park. 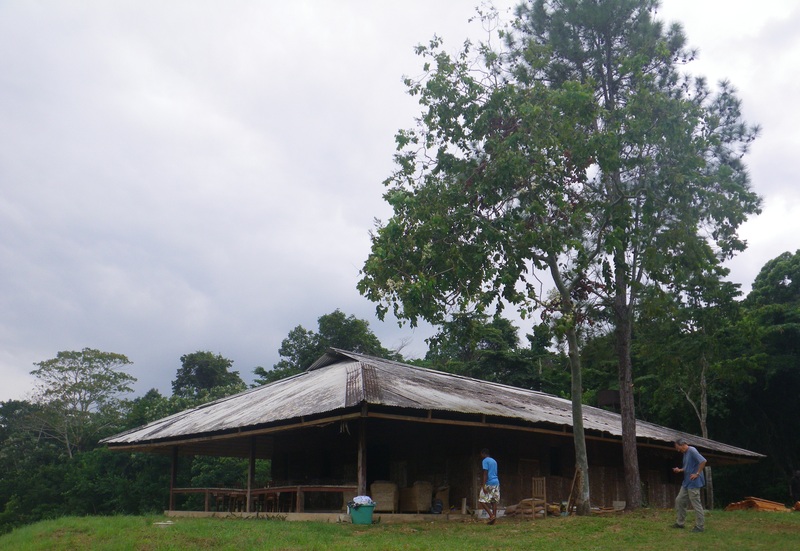 A new camp and a severe nighttime attack of “fouroux” (vernacular name for Simulium). 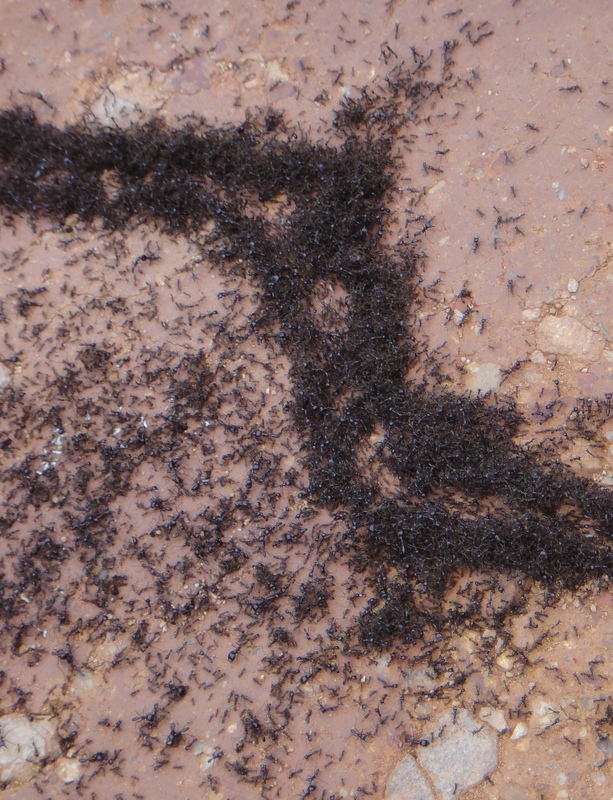 These tiny, fearsome and blood-sucking flies, slip through the mosquito-net that we put over the car windows (we keep them open for ventilation during the night is falling). Sure and many bites ! Kinguélé : formalities with guards who check my authorizations ; then visit the the house rented by ANPN with JT, the guide (in French, JT means “Journal Télévisé” ! ). We must have a guide when we visit a park, it is obligatory. He makes sure we respect rules and takes care of our safety. A small green snake meets us in the house ! JT tries to put it but has no success and then, says : « I kill it ! No way ! We politely ask the snake to leave. It does !!! In the afternoon, we explore the forest under the power station of Kinguélé, along the left bank of the Mbei river. 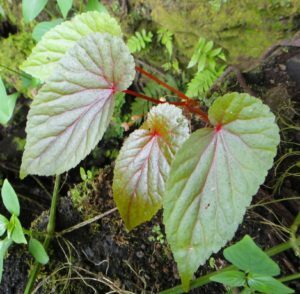 We meet Scutobegonia section species : Begonia hirsutula, B. scutulum (endemic to Gabon) which looks like the previous one but with peltate leaves and B. erectotricha, a rare species (photo 17). We also find B. elatostemmoides and B. auriculata of the Filicibegonia section. We start very early the day after at 2 km from Kinguélé to explore the Mbivame river (a tributary of the Mbei river). 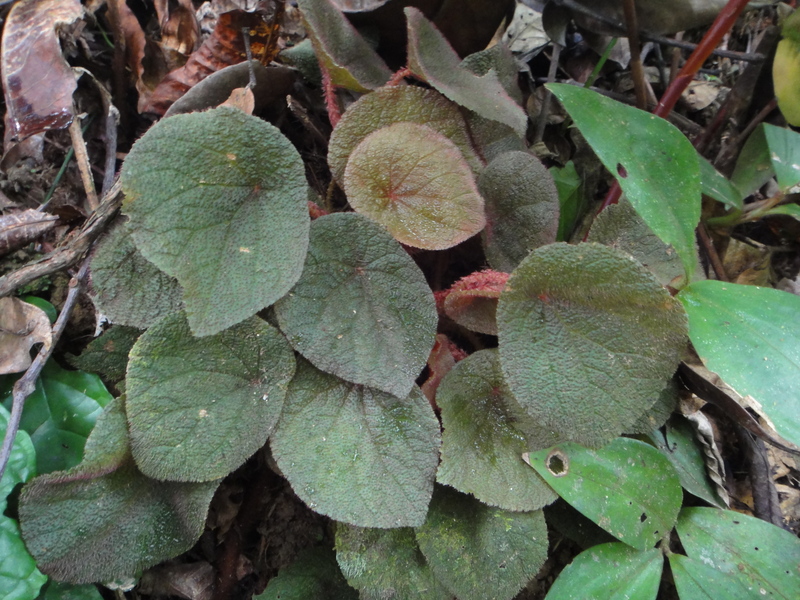 Many begonias here too : B. lacunosa is very very frequent in this place, especially the bullate and dark form; only a few are in bloom and some have immature fruits. 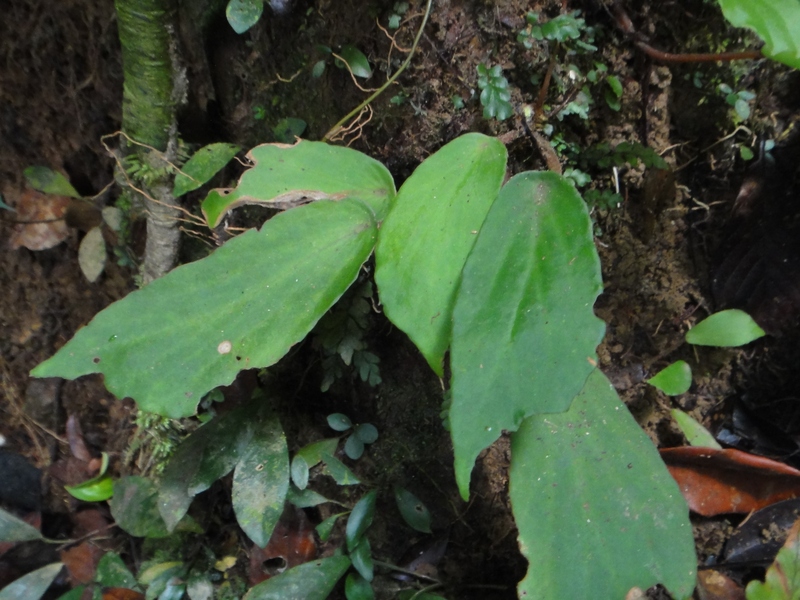 We also find B. clypeifolia, B. scutulum, B. erectotricha and one, only one, B. heterochroma (photo 18). B. sciaphila, B. auriculata and B. elatostemmoides are present too. 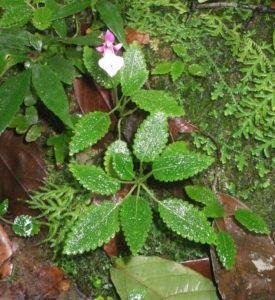 A Gesneriaceae with black leaves and white flowers covers the ground and a very nice small Impatiens grows on the rocks (photo 19). Final day in the Crystal Mountains : we walk on the SEEG (Société d’Eau et d’Electricité du Gabon) path at north of Kinguélé ; B. lacunosa is everywhere, a dark form and a green one (photo 23). We visit the wtaerfall (its name is “Chutes de Kinguélé”) but there’s little water now. However some begonias here: , B. erectotricha and B. sciaphila with fruits. A final river (photo 24) with B. scutulum in bloom, B. hirsutula, B. letouzeyi, B. lacunosa (again ! ) 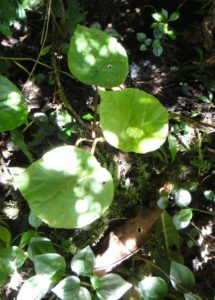 and B. auriculata. Back to Libreville with its traffic jams and the rutted road. We go for food supplies. June 10 : We leave again Libreville , we make an early start for avoid traffic jams in the suburbs. The road asphalt is good from Kougouleu. 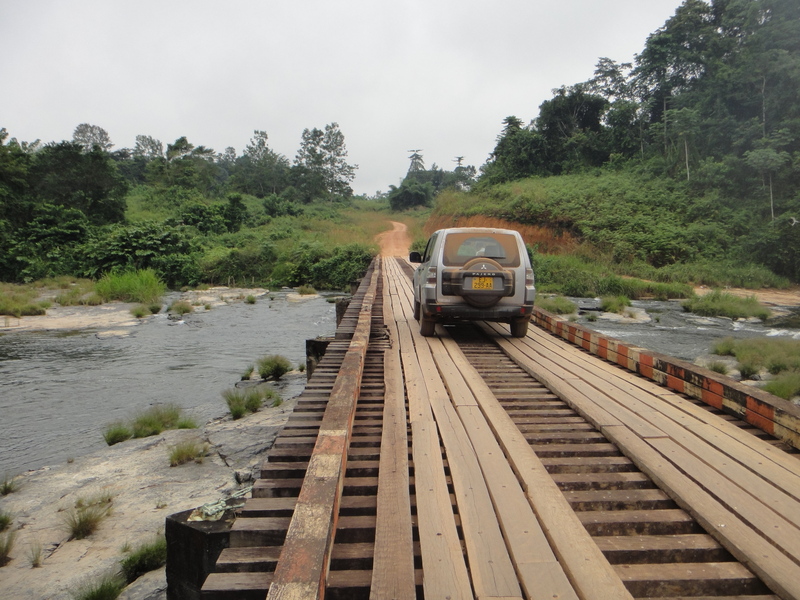 We drive towards Ndjolé in center of Gabon, a mountainous area where many begnoias grow. 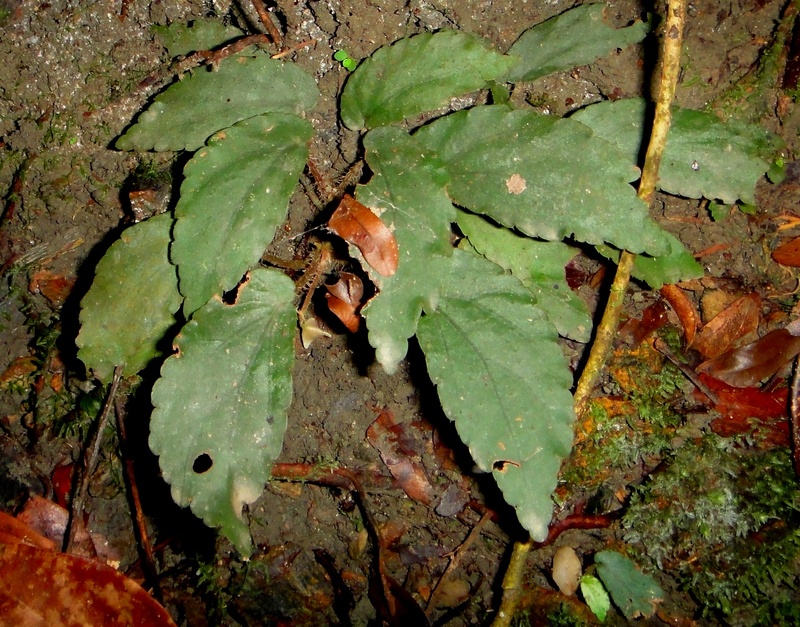 I hope I’ll find Begonia wilksii, a rare species ! We stop to “Auberge Saint-Jean” for booking a room just before starting explore the streams crossed by the road from Ndjolé to Mitzic, towards east. I have some locations from Marc Sosef but unfortunately these informations are invalid : they started from the old track along the Ogoué river, and this road doesn’t yet exist ; a new one was built at north from Ndjolé. More, the GPS spots I have are to within about one minute (in fact, from the Dutchman botanist JJ de Wilde, these datas were set up not in field but after expeditions, on a map with a coverage to within about one minute. At that time, no GPS ! We must know that, in reality, one minute is about 6,000 feet ! In forest or in mountains, it is considerable. 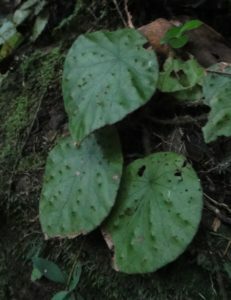 So, impossible to find Begonia wilksii ! Or, we must explore all the streams we meet ! 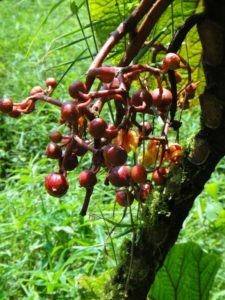 You understand : the problem is always the same, a month is not enough, we must stay six months to Gabon…We explore two streams in afternoon : nothing ! We start early the day after and explore two rivers. At PK 20, in a small stream, we find two interesting species on the slopes of the steep bank : a rare form of Begonia scutifolia with a falcate blade, slightly succulent, with leaves in a horizontal position ; the second species is Begonia lacunosa (photos 25/26/27), with vertical leaves, an elliptic and very asymmetrical blade and white flowers. 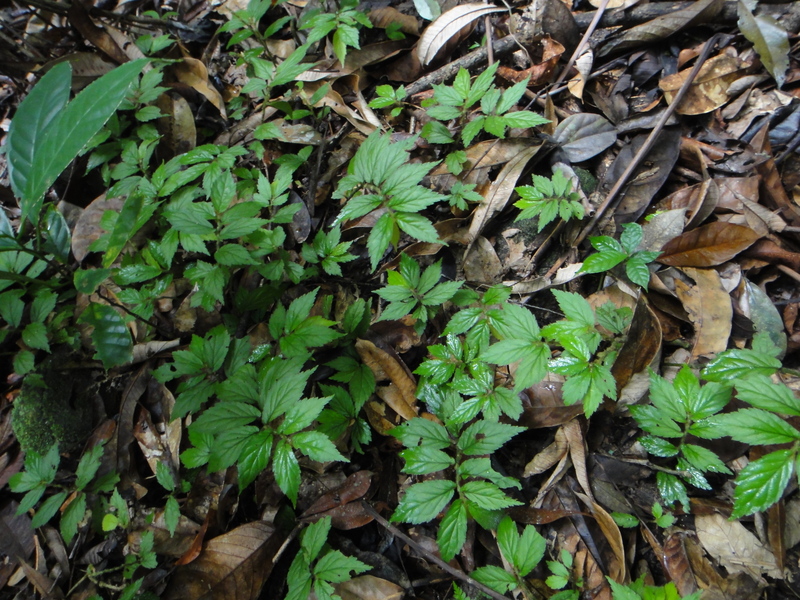 B. scutifolia grows at the base of the slope and B. lacunosa is above. We visit a second stream but, nothing ! Drive in the reserve is difficult : the track is destroyed, in bad repair and often, we cannot see it because of the tall grass ! We’ll see few animals, only a female chimpanzee with her baby, some small monkeys and many feetprints elephants. 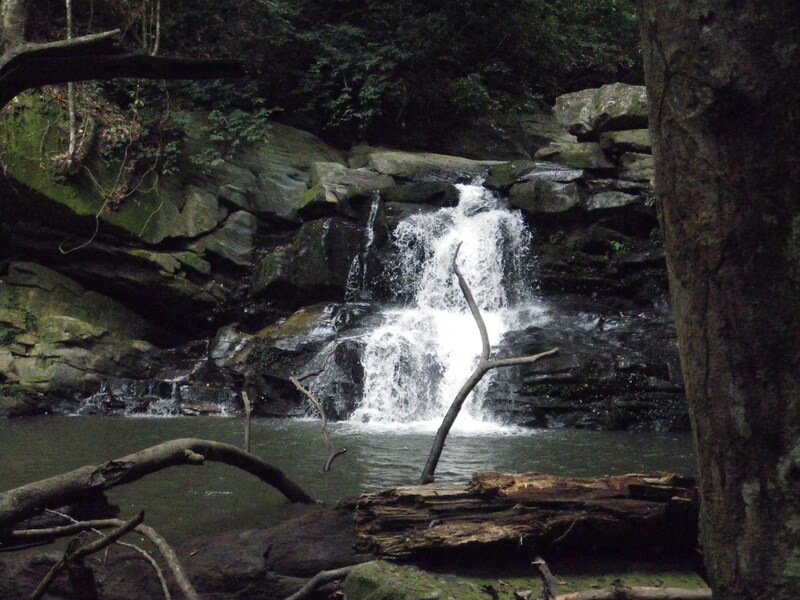 We look for begonias in the forest and near a nice waterfall where we hope find someones ! Nothing ! Very strange ! 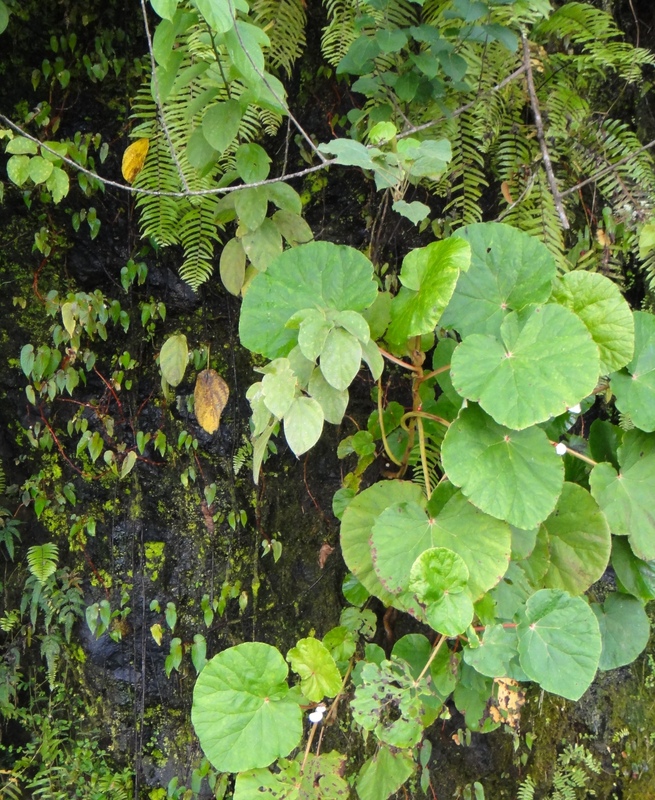 Usually, the stones in streams are true gardens with many plants. 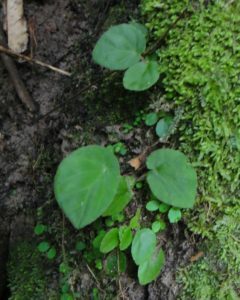 No vegetation on rocks (photo 29), and of course, no begonias ! Is the stone nature ? of the water nature ? The searchers of a scientific resort show us a place where they remember having seen some begonias. 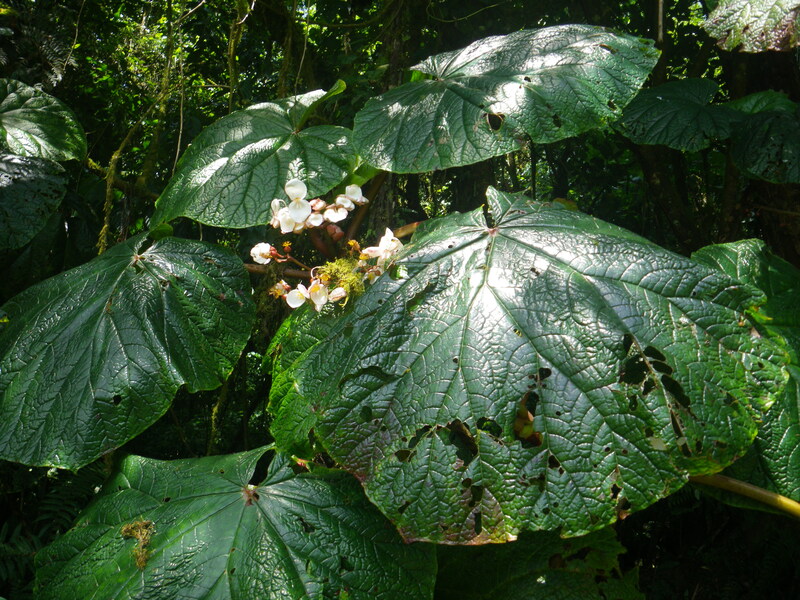 Actually, we find Begonia mildbraedii (photo 30) with flowers and fruits (photo 31), in a stream very difficult accessing to because of the vegetation. 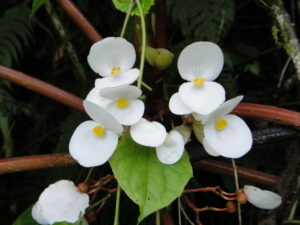 It will be the only begonia of the day. The day after, we drive again towards Ndjolé, Bifoun, Lambaréné, Mouila. Then, we bear east, towards Yeno and the Chaillu Range where grow many interesting begonias. Unfortunately, at PK 35, a bridge is destroyed by a Caterpilar engine ! About-turn and detour by Bililgui.. We reach Yeno, at last and we go towards Mimongo at about 15 miles. Oh horrors, at 2 km from Yeno, an enormous quagmire : 300 feet long and ruts 2 feet deep ! Impossible to croos, even by the 4×4 ! In 2010, we didn’t reach Mimongo, because a big tree fallen on the road ! In 2017, we’ll not go to Mimongo and the Chaillu Range ! Hopeless ! Still about-turn and camp in the car. Along the way southwards on morning without breakfast : fouroux attack ! 3 hours for reaching Doussala at 40 miles from Tchibanga by a very difficult track, especially in the 5 last miles. 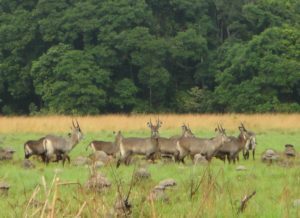 We meet a Defassa waterbucks (Kobus ellipsiprymnus defassa) herd (photo 32) in savanna which stretchs from Tchibanga to Doussala and Doudou Mountains in north. In the distance, we can see the Doudou Mountains covered with primary forest where we plan to go in some days. Set-up in the “Case Madre” (photo 33), old house for the forester who managed the wood exploitation site 20 years ago before the park creation. 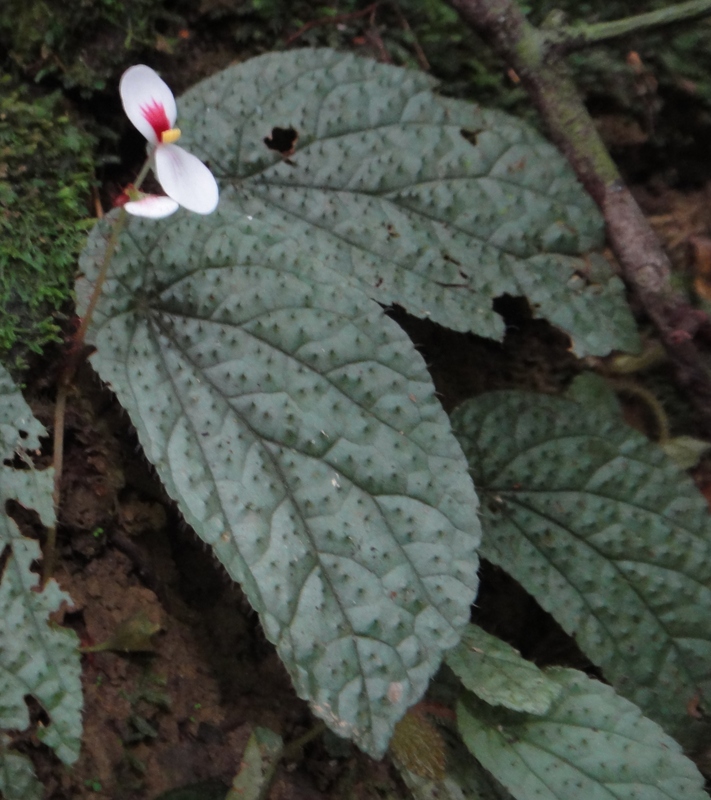 Many endemic plants grow in Doudou Mountains, especially rare begonias as Begonia dewildei. When the bridge still existed, it wa easy to reach the mountains. Now we must cross the river and walk 10 miles until the mountains ! 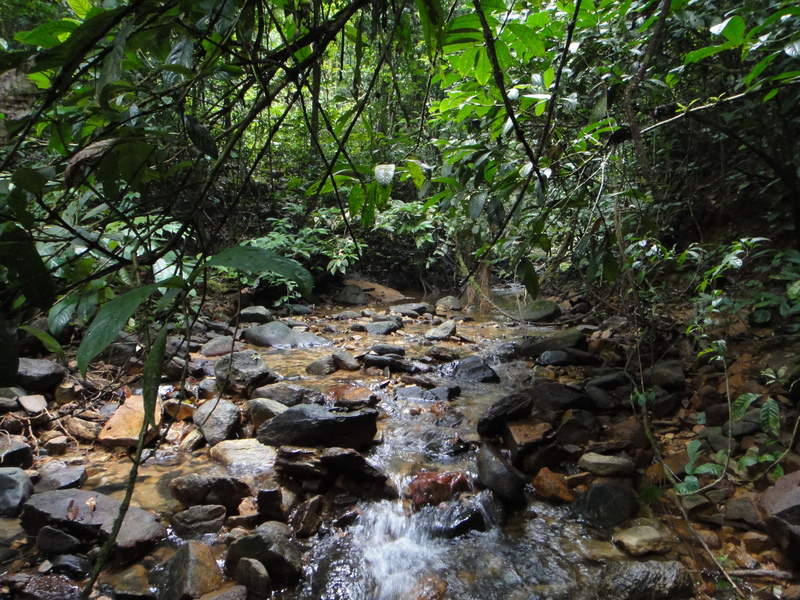 For now, before going towards Doudou Mountains, we planned to stay two days at Doussala for try to observe gorillas. Here, they are in habituation to the people presence. Peter and a guide go with us in forest which begins just behind the Case Madre. Peter formulates the instructions : if we are in danger, we must walk in line, and remain between the guid head, and Peter, to the back ; if elephants charge, we must run and hide behind a big tree…We’ll don’t see any gorilla ! On the other hand, we are charged by two elephants, really no glad to see us ! I lived for five years to Gabon and I have never seen an elephant ! But now, I realize the danger represented by these animals, especially when there are young ones in the herd. And in the forest, we hear but we don’t see them and when we don’t hear them any more, even though they are around, danger ! Luckily, the two charges were short : the big one (a male which watches the herd) stopped after 50 feet (it was better because not any big tree here, only thickets !). We’ll remember a long time the trumpeting before charging. Very impressive ! The second was a young which stopped early. When it charged us from the thickets, we waited for a gorilla because we has seen a very nice…gorilla dropping just before ! 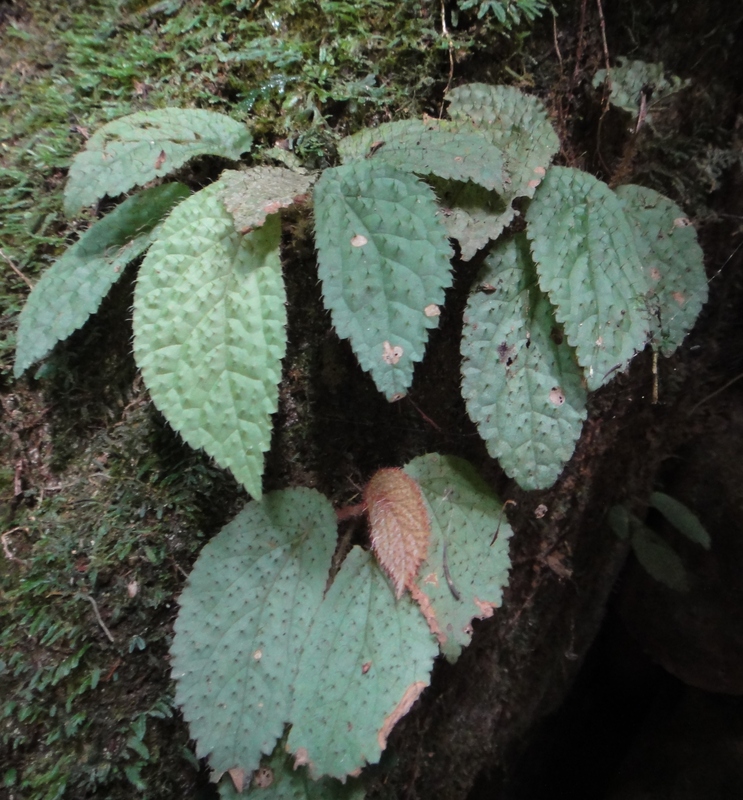 However, we find some Begonia : a very nice form of Begonia lacunosa (photo 34)¸ B. mildbraedii and B. elatostemmoides (photo 35), all in the same place between two lateritic slopes. 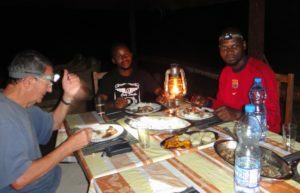 On evening, a great comfort to us at Case Madre : Mamina, our cooker, treats us to excellent gabonese typical dishes (photo 36). Then, we have the second problem of this travel : many fouroux here, by the hundreds, on morning, as soon as daybreak and on evening, at nightfall and especially when it is cloudy. Usually, bites cause a strong but short itch. But for Colette, it is more serious : bites cause cutaneaus allergic reaction with inflammation on legs, aggravated by friction of the pants on the skin. The nearest doctor is at Tchibanga (3 hours ! ) and no telephone network here ! We had planned to go to Mougoubi Mount in Doudou Mountains and the GPS watches it at 12 miles (at the crow files ! ) : it means we must walk 15 miles, at least… We abandon. It would be too dangerous for Colette ! Disappointment ! 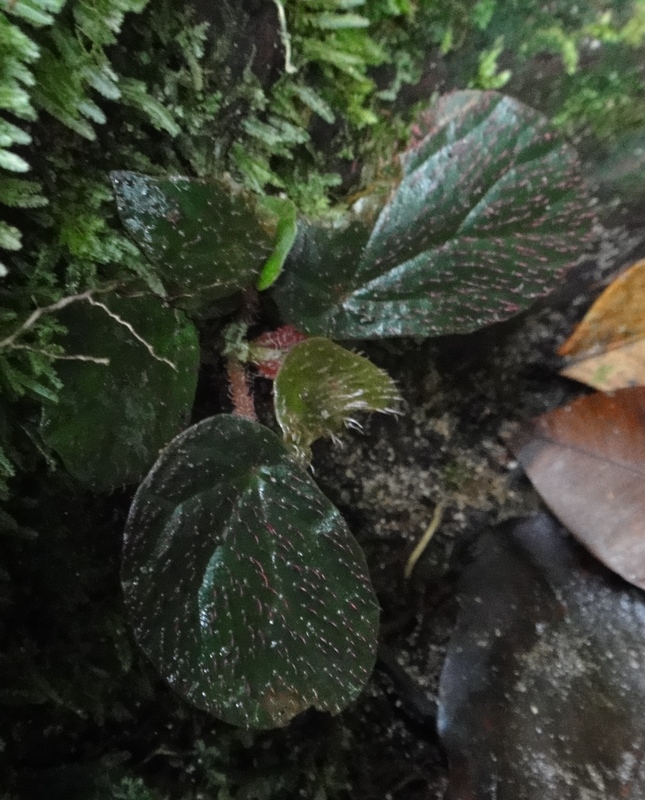 Begonia dewildei grows on Mougoubi Mount ! It is the end of the trip ! We are ahead of the schedule because of the walking to Mougoubi Mt which we had planned for four days. 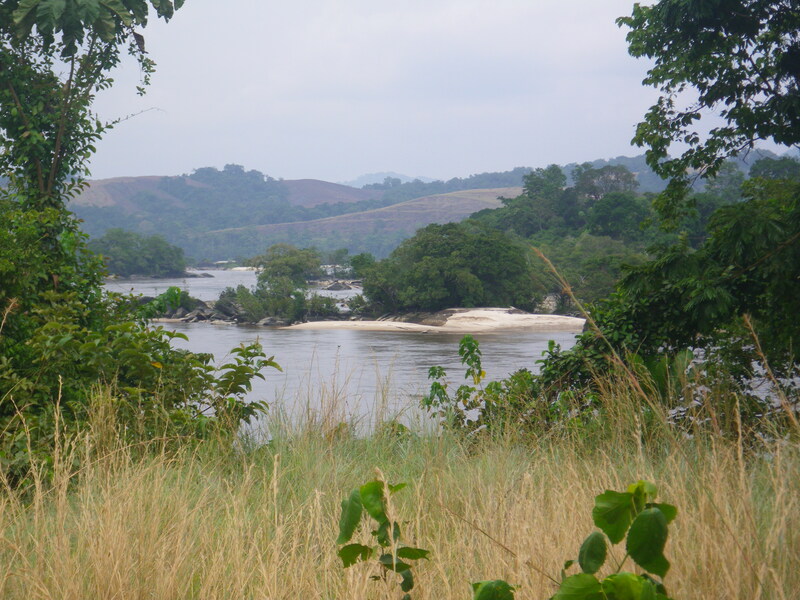 We decide on going back through Ndjolé and explore again the PK 20 river. But this time, I climb back up this nice begonias stream where I find again Begonia scutifolia (photo 37) and B. lacunosa. I find too elephants tracks with fresh dungs ! I’m alone without a guide. Be careful ! 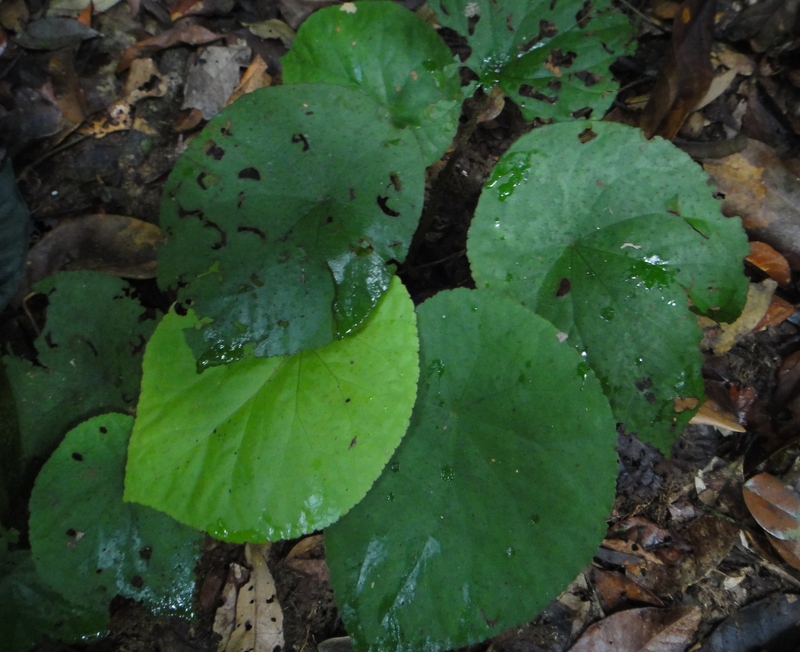 Turn back… At PK 19, another small stream, difficult to access and very shady : B. scutifolia is still present and an unknown species (photo 38) : dark leaves, no peltate, red underneath, with asymmetrical blade , crenate margin; the fruit (photo 39) is typical of the Loasibegonia section plants, with three wings and some white hairs to ends, rare feature in this section. It is not B. anisosepala as we thought with Marc Sosef because of the peltate leaves. Maybe a new species ? Or an hybrid ? But who are its parents ? Only B. scutifolia grows in this place. 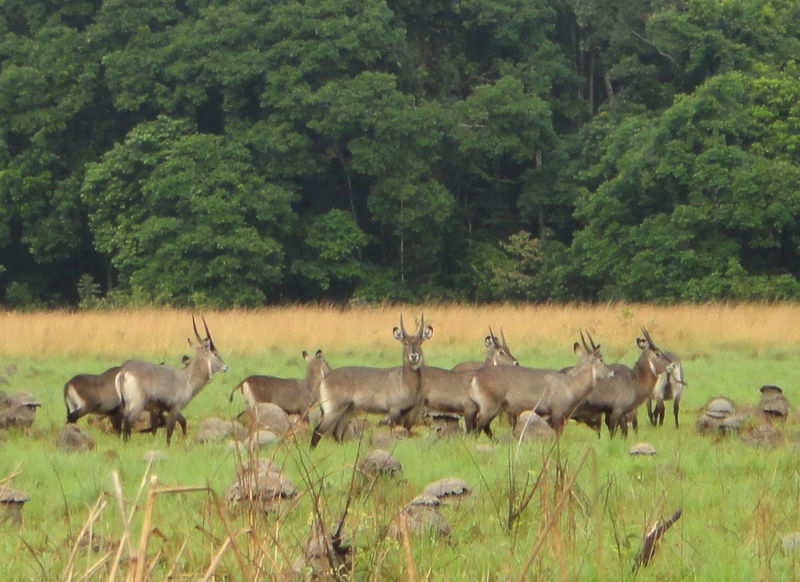 It’s not very likely that we’ll come again to Gabon : too much difficult, before and during…! All these trips would not be possible without you. 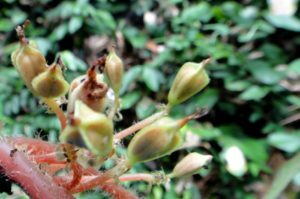 Unfortunately, I bring back only B. baccata seeds from São Tomé. I sent them to you some weeks ago. I hope it will be better for the next trip, maybe to Madagascar in November 2018.